Paradise Pools by Design has been designing and building luxury pools and spas throughout the Central Florida area for nearly two decades. 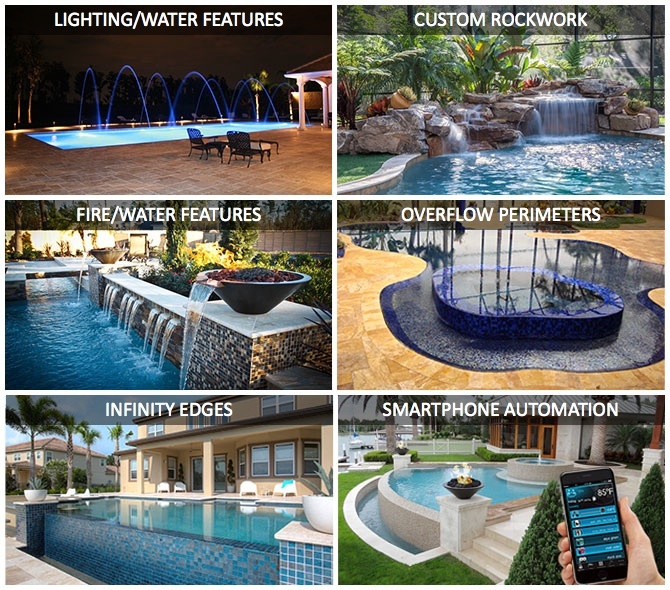 Our pool studio software lets you “walk” through your backyard and “swim” in your pool before even breaking ground. Our extensive step by step construction process ensures that each project is completed with the upmost focus on quality. Let our award-winning team of designers and builders transform your backyard into your own personal paradise! From our custom 3D designs to countless options and features, we’ve transformed hundreds of backyards into personal paradises. Splash pads and water park features are a great way to add fun filled excitement to any project. We offer many different options for apartment complexes, educational facilities, hotels, theme parks and even single family residences. Our commercial division designs and builds pools for the some of the finest hotels, resorts and multifamily developments. Astonish and delight your family and guests with our special features and options such as overflow perimeters, negative/infinity edges, fire pits, fire bowls, custom rockwork, water sconces, deck jets, bubblers, sheer descents, waterfalls, rain arcs and custom LED color lighting. All of these features and more can be controlled through automation systems using a smartphone or tablet.